and the guard Theodore Malgorne, in the storm. In fact, the keepers had been living in fear of death during the 1989 storm and at one point had taken refuge in the lantern room of the tower. Waves the night before had smashed through the lower windows of the tower, causing the structure to flood, washing away everything in its path including the television, table, chairs, coffee maker and even the refrigerator. The keepers in fact were waiting to be rescued by helicopter. Erected on a stone called "La Jument" , "Ar-Gazec" in breton. Passage of Fromveur near the island of Ouessant, Sea of Iroise, west Brittany. In 1990, Jean Guichard won second prize from World Press for his photograph and over the next few years the image became popular in art and print shops. Equipped with a beat-up old sloop and a boatload of literary inspiration, a Mainer-turned-city-slicker sets sail on an epic 2,000-mile journey to rediscover the coast of his youth. Two silhouettes stood at the end of the town pier. An orange streetlight burned behind them. The light reflected off of a silver sedan, the gray siding of Frisbee’s Market, the smooth, black water of the Piscataqua River. There were boats on the river, their bows turned into the ebbing tide. 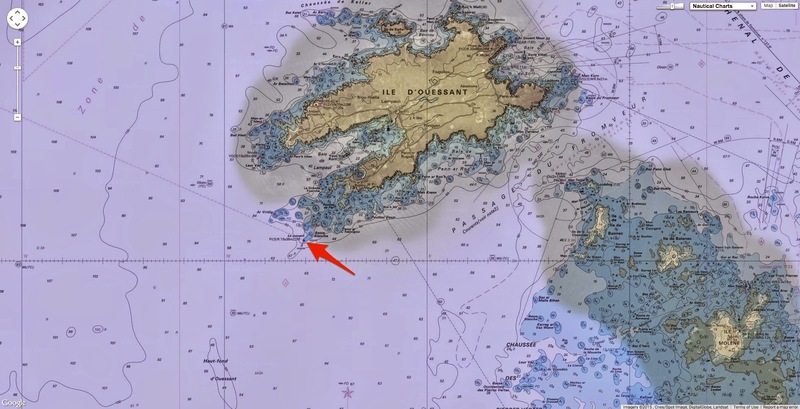 The current submerged lobster pots and tipped the red signal buoy off Seavey's Island at forty-five degrees. In 1820 you could walk across the Piscataqua on the schooners, sloops, barks and brigs moored there. On this night, there wasn’t a soul on the water. The silhouettes moved over the weathered planking. One was wearing a basketball jersey and shorts that reached his shins. The other had auburn hair and soft brown eyes. She opened a folding chair and sat beside a cooler. The boy set the fishing rods down and peered over the railing at a disassembled boat, bobbing in the river twenty feet below. “What the hell’s that?” he asked. The kid grabbed one of the rods and walked away. The boat was crisscrossed with guidelines and dock lines, a futile effort to keep the hull from bashing into the pilings every time a wave rolled by. Tools, sails and broken hardware lay scattered across the deck. The boat was old, but it was new to me. My father had built it in 1978 and I discovered it thirty years later. It looked tiny alongside the pier — a twenty-foot sloop with a cabin so small you couldn’t stand up in it. It took two weeks to prep and repair the thing. Even with the mast and boom on, though, it hardly looked ready for the powerful currents and storms in the Gulf of Maine. The list of broken parts when I started refitting it was inconceivable: two outboard motors, bilge pump, navigation lights, battery, engine mount, furling mechanism, gas tanks, mainsheet, inflatable dinghy, blocks, pulleys, water tank, water pump, three handheld GPS units. God is in these waters, I wrote in my journal after a half-gallon of motor oil leaked into the storage lockers, bilge and drinking water tank. He is here and He is unkind. A lighthouse near Petit Manan. That morning when the Kittery harbormaster told me that I couldn’t launch at the town boat ramp, I almost gave up. Some things aren’t meant to be. But then some are, and you have even less control over them. So I sat in the parking lot until midnight, when the harbormaster’s truck was gone and the tide was high again. Then I pitched the boat into the dark water, paddled it to the town pier, topped the tank with town water, plugged the battery charger into the town outlet and used the town crane to step the mast. It was one in the morning. The kid baited his hooks while I stabilized the mast with four more stays and trued it as best I could. Then I crammed the sails and tools into the cabin. The boat had three bunks, a sink, icebox, water tank and portable head. There were two portholes on either side of the cabin to let in some light and storage space beneath each bunk. That morning I’d added a bungee-corded library over the port quarter berth, including Dorothy Simpson’s The Maine Islands, E.B. White’s book of essays One Man’s Meat; Blaise Cendrars’s The Prose of the Trans-Siberian, and The Road to Oxiana, by Robert Byron. But that’s what this trip was — a journey back in time along the coast I grew up on. Looking back is always different than being there, but I had some gaps to fill in from my childhood. Like why my parents dropped everything in winter of 1975 and moved our family from New York to an island off the northern coast of Maine. Or how my father reinvented himself from a corporate executive into a boat builder. I had questions about the seductive power of boats and the ocean, how they sucked my family in and commanded our lives for three decades. Most of all, I wanted to know how and why all of that fell apart in my father’s middle age, ending in his death at the relatively young age of sixty-two. My supplies for the trip — a heap of my camping gear, the inflatable dinghy and more broken parts — obscured most of the town dock. Beyond the pile and the ghost boats pulling at their moorings, an invisible line drawn 250 years ago runs down the middle of the river. South of the divide, the New Hampshire coastline wraps around New Castle Island, Little Harbor and Odiornes Point, then drops in a near-plumb line to Massachusetts, Connecticut and the eastern seaboard of the United States. To the north, the frayed edge of Maine wends around Badgers and Seavey islands, in and out of Spruce and Chauncey creeks and up, over and sideways through a maze of rock ledges near Hicks Rocks and Fishing Island before turning north to the craggy shores of Kittery Point and Brave Boat Harbor. The boundary marks the southern edge of the state of Maine. To me, it was also a starting line. Some seven thousand miles north at the Canadian border, around the capes, headlands, narrows and necks of the longest coastline in America, I hoped to find the end. 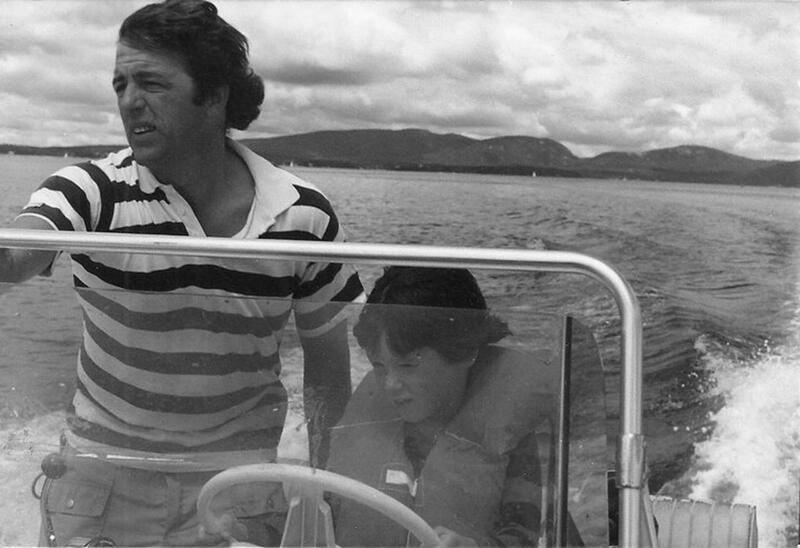 My father teaching me how to drive our motorboat in 1978. 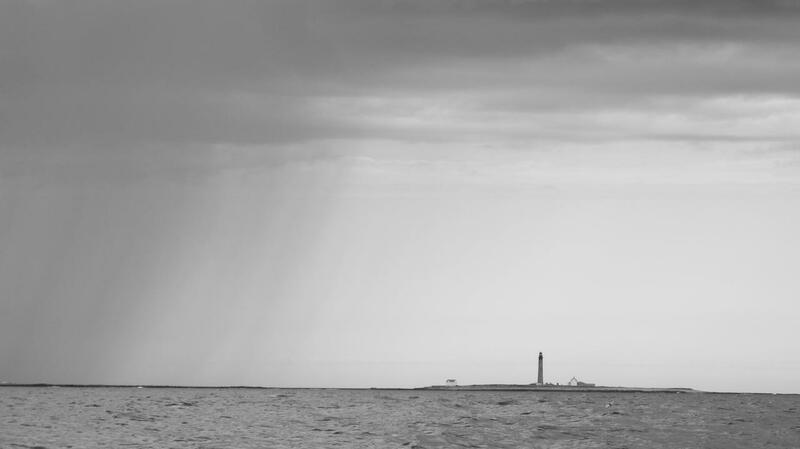 A cottony squall line appeared on the horizon as I sailed into my first port, Gosport Harbor in the Isles of Shoals. There were mare’s tails before the squall, hazy cirrostratus above it. Two-dozen other boats pointed into the coming gale. Eight ring-billed gulls hunkered down onshore. The Isles of Shoals aren’t exactly on my route, but the state line runs through them a few miles east of Portsmouth and I didn’t want to miss anything. Half the boats around me were in Maine, half in New Hampshire. I wasn’t sure which state I was in. I knew I was stuck there until the storm passed. The computerized voice of NOAA crackled on the VHF radio. The coming storm front packed sixty-mile-per-hour winds and possibly a tornado. Sunrise: 6:35 a.m. Sunset: 7:13 p.m. I went below and closed the hatches. The first wind hit a few minutes later. Just before the rain and lightning, the sky glowed pink and the air turned sweet with the smell of lavender. I ate tortillas and beans in the cabin while the rain came down. I didn’t have time to shop before pushing off and had food for only one night. Saucer-shaped clouds drifted overhead and waves crashed into a seawall built between Cedar and Smuttynose islands. 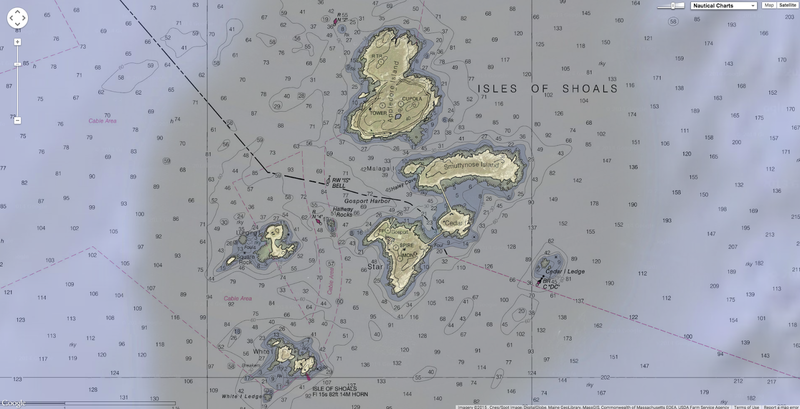 The dark stone beaches of Star Island to the south and Appledore Island to the north complete the harbor and the major islands of the Shoals. The group is named for shoals of cod, not the rocky shoals that encircle it. Seaweed-covered and blackened by the ocean, the islands rise up from the tidewater, meet a ring of woodbine and shadbush, then finally give way to windswept grassy fields and stands of spruce running east-west. After the storm passed, I closed up the boat and motored the dinghy ashore to find food in the Star Island Inn. The two-hundred-room inn, built in 1873 as the Oceanic Hotel, was now owned by the Unitarian Church. The clergy bought the island, too, and held retreats and conventions there in the summer. A young churchgoer assigned to receive guests at the dock took the dinghy’s bowline and invited me ashore. She was wearing a bright-green bikini and pointed to the snack bar on the ground floor. If I wanted to see the Vaughn House, she said, I should hustle. It closed in fifteen minutes. I didn’t know what the Vaughn House was, but the rule was to follow every twist and turn of the coast. So I walked a winding gravel path past the gift shop and over a small hill to a cedar-shingled shack. A sign on the door said it was closed for cleaning. Since no one was around, I walked in anyway. The ephemera of nineteenth-century poet Celia Thaxter was preserved inside. Thaxter grew up on the Shoals, where her father was a lighthouse keeper on White Island, then the proprietor of the Appledore House on Appledore Island. She worked at the inn and entertained writers and artists vacationing there, like Childe Hassam, Ralph Waldo Emerson, Henry Wadsworth Longfellow and Nathaniel Hawthorne. In 1861 Thaxter’s first poem, “Landlocked,” was printed in The Atlantic Monthly. By the end of the century she’d published nine books of poetry and nonfiction and was one of the most popular writers in New England. Items from her life sat in glass cases set around the single room: typewriter, pens, manuscripts, hand-painted china, a telescope she used to watched ladies walking the streets of Portsmouth. A writer’s tools are meant to be used, though, not looked at, and the display was not as interesting to me without words attached. I returned to the snack bar to buy food and pick up a copy of Thaxter’s memoir, Among the Isles of Shoals, then navigated a throng of eager churchgoers stepping off the ferry and motored back to the boat. An hour later, propped up on three cushions in the cockpit, I had to stop reading because both of my legs had fallen asleep. The thing about going back is you never get it right. It is unreal now; it was unreal then. I could never find the words to explain the experience of growing up on an island. Maybe that’s because I left before they came. Thaxter left the Shoals only a few times and always came back. Her recollections run like a current through her memoir, never-ending descriptions layered on top of one another, one depiction spilling into the next. She writes about Samuel Haley, who financed the Smuttynose-Cedar Island seawall with four bars of pirate silver he found under a rock; and the saltworks, windmills and orchards he created. She describes a string of frozen corpses reaching from Haley’s front door to the splintered Spanish schooner, Sagunto, one stormy January night — how she walked among the fourteen shallow graves Haley dug the next day. The first church on Star Island, she writes, was built from the timbers of wrecked Spanish ships. The language of the sea comes in word combinations: salt gravel, traprock, song sparrow, skipjack and wolffish. A minister and his congregation called his skinny wife “Laigs” her entire life. A Norwegian family was christened Carpenter, though they’d never lifted a hammer. Islanders’ nicknames were markers: Bunker, Shothead, Brag and Squint. Everything had its place on an island, I thought. That was a difference. I found a tortilla in the cooler and wrapped it around a hunk of cheese that I bought at the snack bar. With the food in one hand, I tilted the book into the dying light with the other. Thaxter writes of the Shoals’ tiny fleet running before a storm — after fishing Jeffrey’s Ledge forty-five miles out to sea — then taking shelter in the lee of Appledore Island. A half-mile away, in the warmth of the Appledore House, she watched their masts tip almost horizontal to the water until twilight came and they vanished in a purple haze. The other boaters had gone below to eat. There was fog in the harbor. The sky swirled silver and gray. I realized that some of my anxiety about taking this trip came from the fact that I’d moved away from Maine. And did that mean that I couldn’t write about it? Mainers are fiercely protective of their history and culture. They say it takes three generations born in-state to call yourself a native. My mother had been a summer vacationer. My father pronounced himself a boat builder so quickly, that sometimes our whole presence in Maine seemed superficial. But Thaxter’s words brought me back. They conjured images of my own youth in Southwest Harbor — of fisherman’s kids smoking cigarettes outside the Pinball Palace when school let out. Of the smell of diesel and fish bait on Main Street while weatherworn lobster boats unloaded their catch at the town dock. I recalled sitting on a ledge in the middle of the ocean before dawn with Crozer, waiting for flights of eider to glide down to our decoys. The island and my memory of it were my home more than anywhere else, I realized. I turned on the VHF. There were more thunderstorms tracking across the mainland. It would blow tomorrow too, the voice said. A boat circled Gosport Harbor. I recognized its low-slung lines, the open cockpit, tan bimini collapsed on the bow. The cherry console and teak decking were familiar — auburn and gold. The boat was a Somes Sound 26, a replica of a Newport launch, twenty-six feet long with a 240 horsepower Chrysler inboard engine. My father built it. It was one of seven motorboats he ever built. The rest were all sailboats. The timing, chance and message — if there was one — were overwhelming. The scene seemed staged, like it was lifted from one of my dreams. I sat motionless and watched the boat head west toward Portsmouth. It picked up speed and a thick, white wake rolled off the stern. I opened Thaxter’s book again. The words were black splotches on the page. I flipped to a dog-eared passage I’d read a half-dozen times. Pleasanter still to think of some slender girl at twilight lingering with reluctant feet and wistful eyes that search the dusky sea for a returning sailor whose glimmer was sweeter than moonlight or starlight to her sight—lingering still, though her mother calls within and the dew falls with the falling night. She walked these shores most of her life, but especially in her young life. And it’s in your young life where the living begins and where it was strongest. And you will always go back to that until you were old and weak as a child and happy that you have no care in the world again. 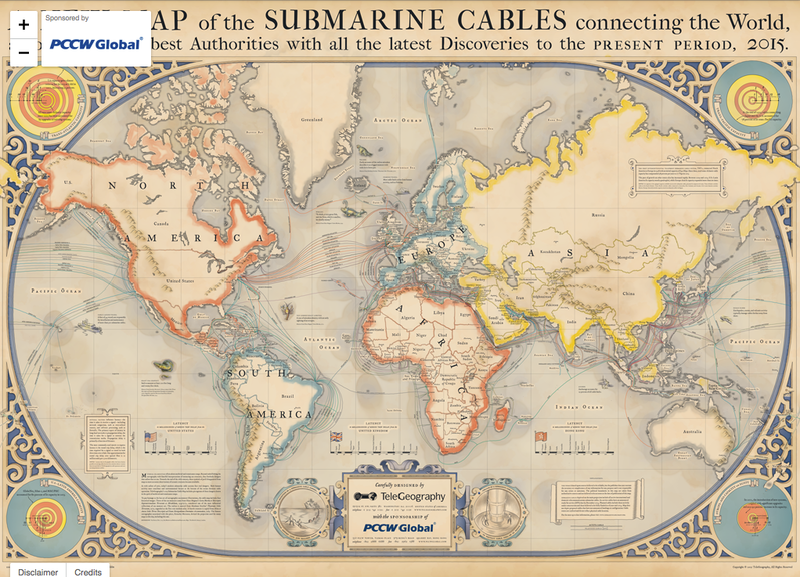 Every year Telegeography create an undersea cable map of the world and every year the map gets better. 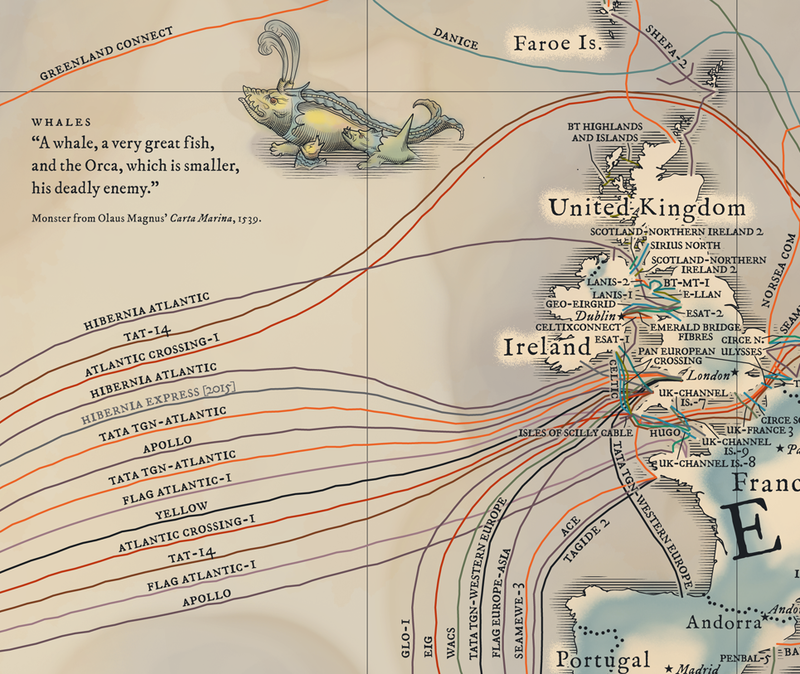 The 2015 Submarine Cable map is inspired by medieval and renaissance cartography and features not only a vintage map style but sea monsters, map border illustrations and images showing some of the common causes of cable faults. The border illustrations provide information on the capacity data of some of the major cable routes. Other inset illustrations provide information on how submarine cables are laid. Digital publications can replace many books onboard yachts. Walking around the bridge of a new, 145-foot superyacht, the build captain can’t help but smile at how modern it is. Sure, it has five touchscreens on the glass bridge and myriad other technological advances. But the one that gets him most excited is the lack of paper and books. “We have no chart table and minimal book shelves,” this captain said, asking that neither he nor the unlaunched yacht be named. In the past year, more and more flag states have agreed to accept digital versions of the several dozen publications yachts must carry onboard and still remain compliant. Beginning last spring, these required navigational publications began to be available in digital formats — known as electronic Nautical Publications (e-NP) — including sailing directions, coast pilots, GMDSS, SOLAS, MARPOL, STCW, IAMSAR, and more. Its electronic-Nautical Publications (e-NPs) and ADMIRALTY Digital Publications (ADP) can now be used on board ships sailing under the flags of those states, while still remaining compliant with the IMO’s SOLAS carriage requirements. As a result of these latest approvals, the UKHO claims that over 79 per cent of the global fleet is now authorised to use digital maritime publications rather than hardcopies. The publications cover topics such as sailing directions, light and fog signals, radio signals, and tidal movements. 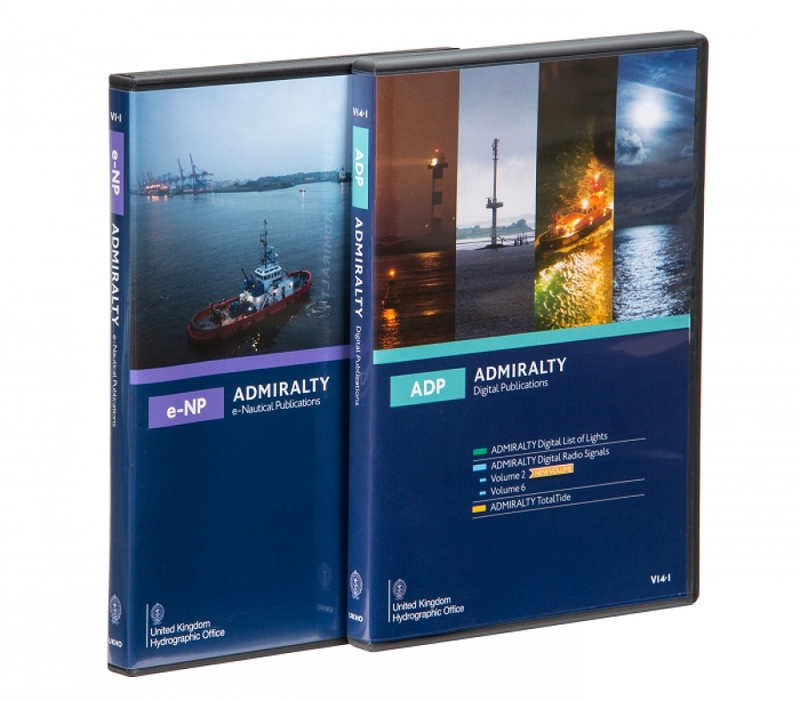 There are two main providers of e-NPs, IMO Bookshelf and UKHO Admiralty, each with its own advantages, and both compliant. As a yacht’s publications begin to expire, more captains are looking to transition to digital. Capt. Jeff Ridgway is switching the 153-foot M/Y Ingot to digital and has noticed hours of crew time is being saved. 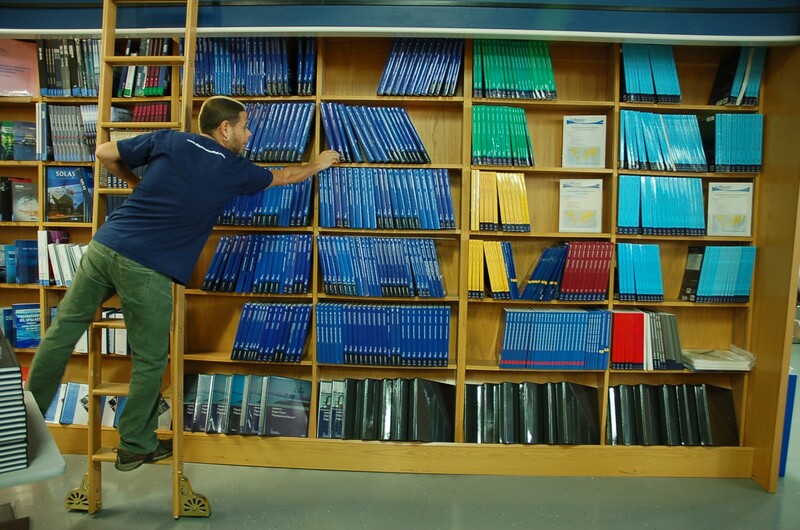 Not only do these products replace hundreds of pounds of books, electronic updates also eliminate having a crew member manually correct the weekly Notices to Mariners. “As far as publications go, they were always a big job,” Capt. Ridgway said. Subscription-based digital publications offer several benefits. For one, they may make for safer navigating. “It is possible that updates are not done as frequently as they should be, given a crew’s busy schedule,” said Justin Mann, president of superyacht bridge services at Bluewater Books and Charts in Ft. Lauderdale. Paper supplements and amendments no longer need to be mailed to a yacht. And crew can simply print a weekly certificate of compliance to satisfy flag or port authorities. With electronic systems, however, there is the possibility of failure in software, hardware or power. With that in mind, flag states require at least one backup on a separate computer on separate power. M/Y Ingot keeps its publications on a laptop and on the ship’s server, Capt. Ridgway said. “The requirement is to have two ways to access it, and we have UPS [uninterruptible power supply] on the computers so we could access it for a while if power goes down,” he said. United States Coast Pilots is a nine-volume American navigation publication distributed yearly by the National Ocean Service. 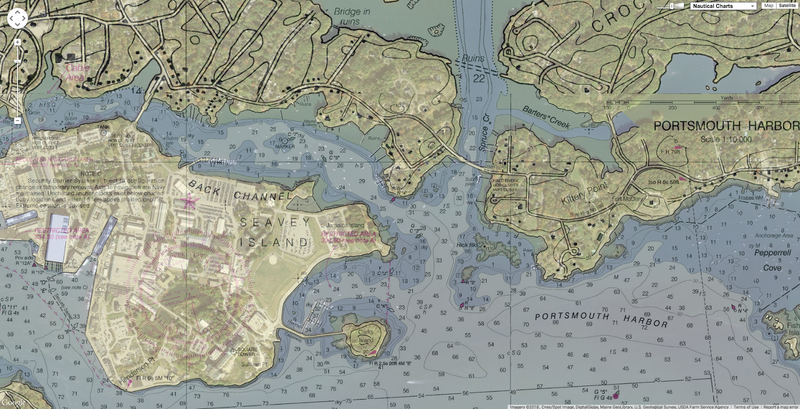 The purpose of the publication is to supplement nautical charts of U.S. waters. Information comes from field inspections, survey vessels, and various harbor authorities. Maritime officials and pilotage associations provide additional information. Coast Pilots provide more detailed information than Sailing Directions because Sailing Directions are intended exclusively for the oceangoing mariner. Each volume of Coast Pilots must be regularly corrected using Notice to Mariners. Another option is to store the publications remotely — either with a shore-based support person or even in the cloud — which can be accessed in case of failure. “I had a yacht in the yard that did a build out, but the computer was damaged,” said Danila Richards of Large Yacht Service in Ft. Lauderdale, which helps yachts stay compliant. Some captains are not ready for these electronic changes, and they don’t have to be. Going digital is not required, so navigators can choose to stick to paper charts and books. “Captains should know that they have to be the type that likes to deal with electronics, and they have to understand the nature of receiving electronically,” Richards said. Most yacht crew, however, are comfortable with electronic charts, and Bluewater’s Mann sees more embracing digital publications. As with all things computer-related, the field will continue to evolve and will become more efficient. Most of the required publications are expected to be available in digital format by this spring, Mann said. Capt. Ridgway and Ingot are in the final stages of the transition. “We are working through the bugs and getting everything to work with servers in the UK for the updates to come through,” he said. 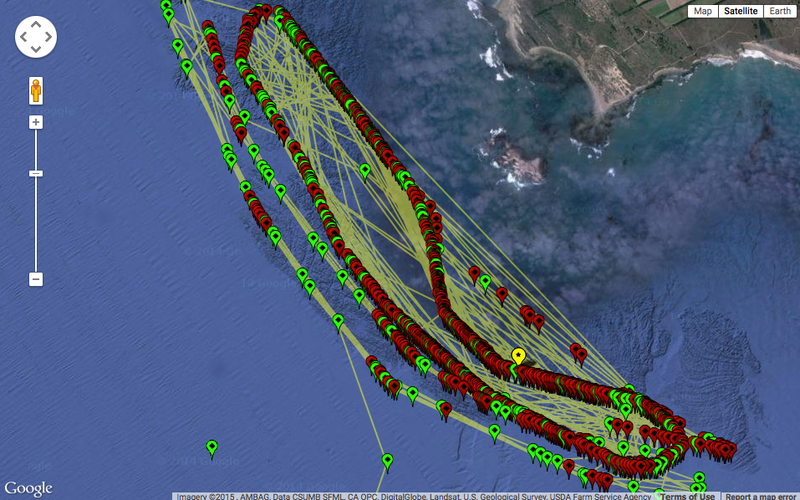 New technology allows the public to track the movement of great white sharks as they travel along the Central Coast. These new tracking devices might give swimmers a little sense of relief, but that's not what their intention is. Marine biologists have been working for years to learn more about the behavior and swim patterns of great whites. Marine biologist Dr. Randy Kochevar has made shark encounters a focus of his research. Following the migrating patterns of sharks, he found the great whites along the Central Coast spend half of their time close to shore and half in deeper water. "Once we started to identify these hot spots where they come and go to we started exploring new technologies that would allow us to monitor their coming and going from these areas," says Dr. Kochevar, marine biologist with Stanford University's Hopkins Marine Station. This map shows the tracks of the currently deployed Wave Glider, which is equipped with an acoustic receiver which is listening for white sharks carrying acoustic tags. 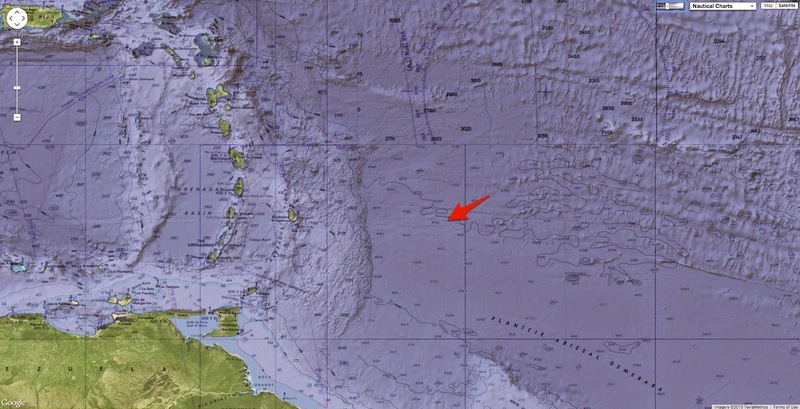 The current position of the glider is indicated by a yellow marker with a star; previous locations are indicated with green markers, and shark locations are in red. To track the sharks marine biologists use a device called a wave glider. The glider, made in the Silicon Valley is powered by solar panels. Right now, the glider is centered just north of Santa Cruz at Ano Nuevo State Park. By mapping a figure eight pattern it's detected all these great whites in red (see video above) within the past 12 months, and for the first time ever, the public can see within seconds where a great white might be swimming. Scientists from the Monterey Bay Aquarium and Stanford use a seal decoy to lure the sharks in so they can tag them. So far, more than 200 sharks have been tagged and tracked by the glider and buoys posted at shark hot spots up and down the coast. "We will be able to manage them in a way that is sustainable so that whether its our kids or grandkids or their grandkids that they will be able to come to the ocean and know," explains Dr. Kochevar. "That there is this abundant and diverse ecosystem right here." It may not be what you want to see in the ocean, but sharks are an important part of marine life that these scientists want you to understand. Dr. Kochevar says that the number of great white sharks in the Central Coast is actually smaller than they thought. There are as few as 250 along the California region. He says they don't know if that number means the population has increased or declined, so now they are gathering data with this new technology to keep a closer look. This map shows the tracks from tags that have reported within the past 30 days. If you're interested in detecting a shark along the central coast you can go to TOPP.org. Click on "Buoys" to see a list of the most current sharks in that area. Mpora : Shark Attacks Are On The Rise.... Is This The App Which Could Cut Them Out? Ever since they were discovered in 1873, scientists have been trying to find out the origin of the millions of potato-sized metal balls that carpet the world's oceans. 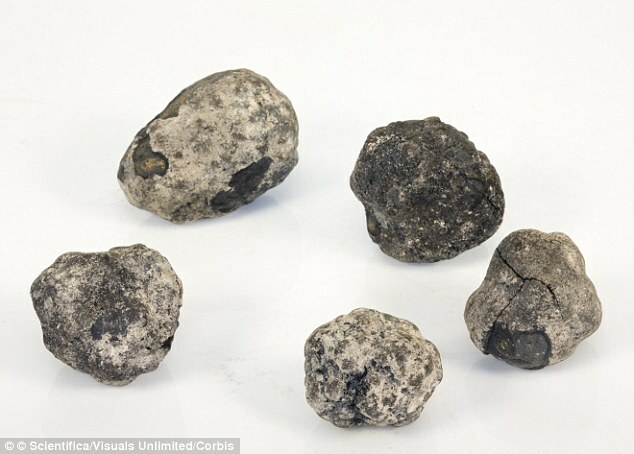 Known as manganese nodules, these lumps contain valuable metals that scientists someday hope to harvest from the sea floor. Now German scientists could be closer to solving the mystery of their origin after stumbling on the largest patch of manganese nodules ever found in the Atlantic. Ever since they were discovered in 1873, scientists have been trying to find out the origin of potato-sized metal balls that carpet the world's oceans. With growth rates of between one to five millimetres in a million years, some of the nodules could be 10 million years old, the researchers said. 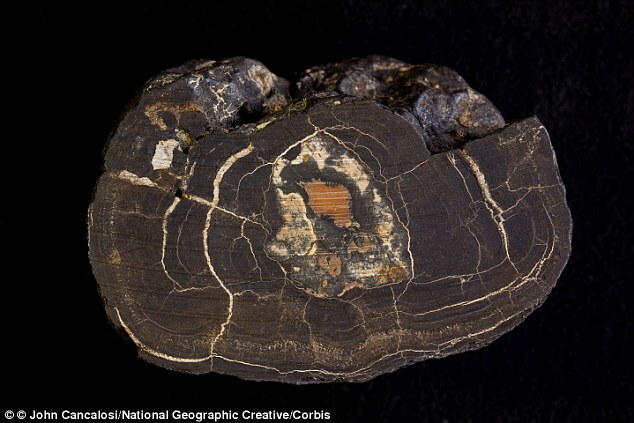 'I was surprised, because this is generally not the place you think of for manganese nodules,' said Colin Devey, chief scientist for the expedition at the Geomar Helmholtz Centre for Ocean Research told LiveScience. 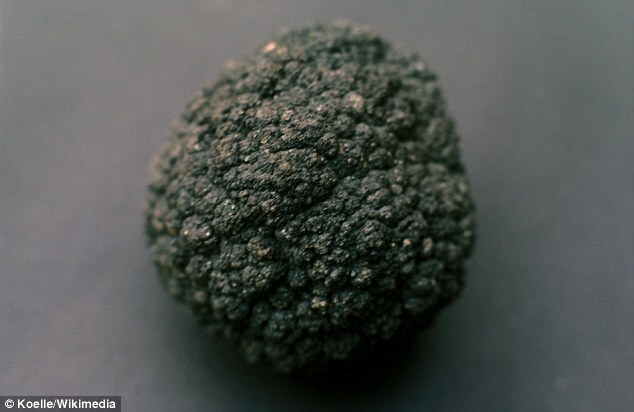 Manganese nodules have been found in every ocean, but are most common in the Pacific Ocean. These particular nodules were discovered in waters roughly 16,400ft and 18,000ft (5,000 and 5,500 metres) deep. In the Clarion-Clipperton Zone are the largest known manganese nodule deposits. One theory as to how they formed is through chemical reactions in seawater that were boosted by microbes. Another suggests the nodules were created by precipitation of metals from seawater, especially from volcanic thermal vents. These metal balls consist of the manganese and contain iron and other coveted metals such as copper, cobalt or zinc. Since the 1970s, they have been considered a possible source of raw materials. 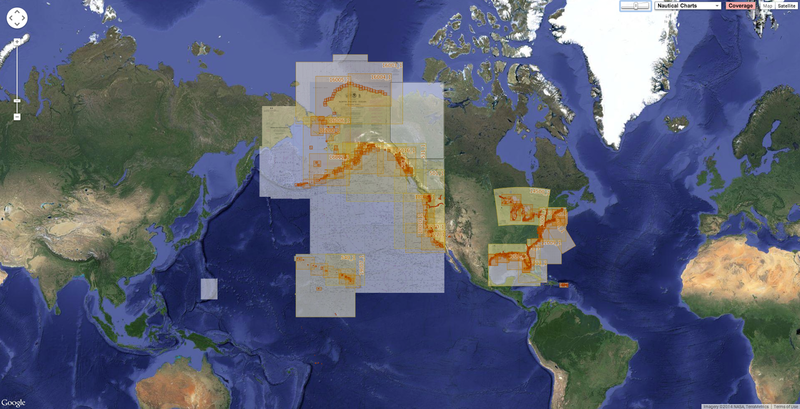 But due to the large water depths and the associated technical complexity and potential environmental damages, no commercial exploitation is currently in sight. At the same time, manganese nodules are scientifically of great interest since they can be used as climate and environmental archives. Manganese nodules grow like a pearl shell around a nucleus and as a result record information on the prevailing environmental conditions. Since the nodules grow very slowly, they provide a record of the world's early climate history. Scientists are now hoping to analyse the nodules in greater detail to understand exactly how they formed. They say greater analysis could also unlock the secrets to our planet's changing climate. 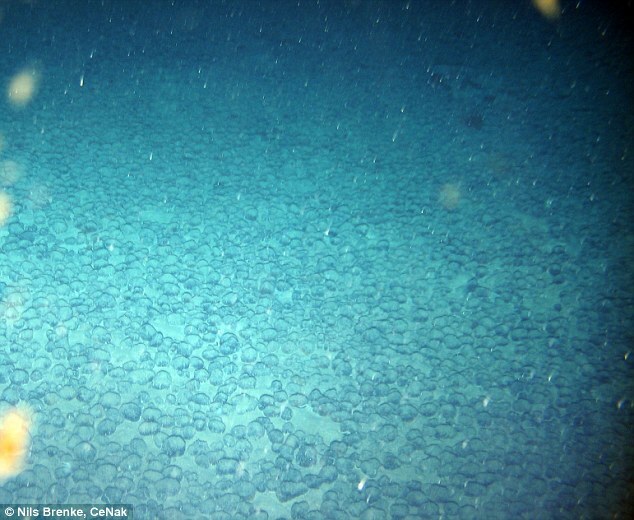 Geomar : Looking for deep-sea animals – and finding manganese nodules / Deep-Sea Mining: What are the risks?